Stay Around was compiled by those closest to Cale – his widow, musician Christine Lakeland Cale, and friend and longtime manager, Mike Kappus – and will be released on April 26, 2019 via Because Music. Preorders are available now. 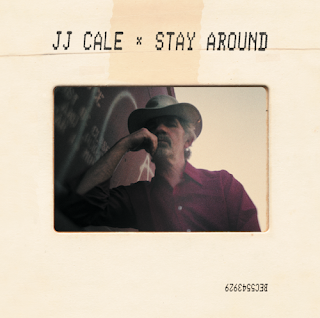 For the first time in a decade, listeners will be moved by a new collection of unreleased Cale songs, a feat that’s possible due to Cale’s modus operandi: often Cale would reserve outtakes from one album for later release on another. In compiling Stay Around, Christine pored over songs, both studio and home recordings, that the public had never heard. The result is an album mixed and produced by Cale himself, left nearly untouched to leave, in Christine’s words, the “Cale Factor.” The only song not written by Cale is Christine’s “My Baby Blues,” the first song she and Cale cut as a four-piece combo in Bradley’s Barn studio in 1977, the year they met.